The DEATH of the SKRULL HOMEWORLD! 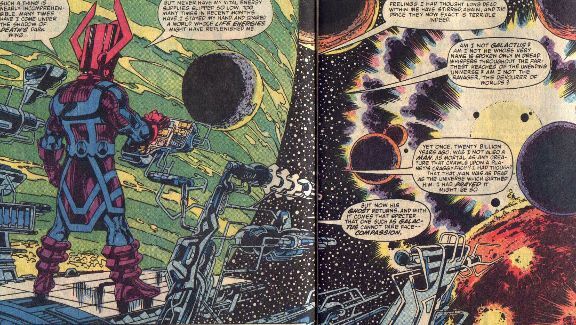 I have to admit, I have a weakness for Galactus stories. I am normally not a big FF collector (though that may change depending on how the quarter bins go). There is just something irresistable about seeing someone eat a whole town (or planet, or star, or whatever). Munch, munch, munch. Just like Godzilla. FF 257 begins with Galactus, the world devourer, on the verge of death. After a period of fasting because of the moral implications of eating populated worlds, he loses energy and even begins conversing with Death, his "sister, daughter, mother, and wife". He sends out Nova, his then-present herald, to search for ANY sustanance, inhabited world or not. There is a brief introspection on Nova's part as she considers her feelings for her master, then some action scenes as she easily shatters the Skrull's defenses. The crux of the issue has Galactus going to work, doing what he does best -- and satisfyingly well. This is what I expect to see when a planet in the Marvel universe dies. Bloated, Galactus lies like a beached whale as he digests his meal. The remainder of the issue centers around current FF events at the time, in this case, reviewing the private lives of the FF, as Johnny Storm strikes out on his own, and Reed and Sue decide to commute from their secret identities in the suburbs. It ends somewhat abruptly with Reed disappearing on the Scarlet Witch as he pays a house call to her husband, the Vision. The rest of the issue focuses on the X-Men's escape from Skrulltown, and has a unique twist on suspended animation, I'll not spoil it -- suffice it to say that they arrive pretty much at the same time at which they evidently started time-hopping. The issue ends with a "stay tuned" type of climax that won't really kill ya if you don't catch it. 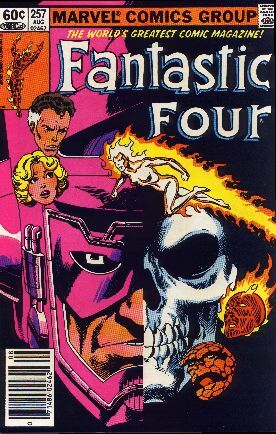 FF254: Galactus is humanized in an interesting way: he suffers the same problems and faces Death with a very respectable degree of composure. The opening scene with him is gorgeous and the fact that he actually SUCCEEDS in changing the map of the Marvel Universe makes this a special issue. X-Men90: I actually got this comic for 50 cents (ok, so not a quarter, big deal) before I got FF254, but really I wish I had read the FF book first. Put together, the two stories read like a great two-part mini novel, except that they are time-spanned by 16 years! This kind of thing is done (and even more blatantly so) with comic book covers all the time. In this case, it is interesting to look at the two side by side. Byrne's work captures you with the same anticipation as you'd see in any Godzilla movie. You really want to root for this bad guy. Davis' brings out a more human touch to Galactus -- I'm glad we got a better look at the expression on his fact that Byrne refers to. I could've done without the soap opera in FF257. And the Skrulls in X-Men 90 just looked kinda goofy, like bumpy Gumby's. I'm not really qualified to rate FF257 on the basis of being an FF book. 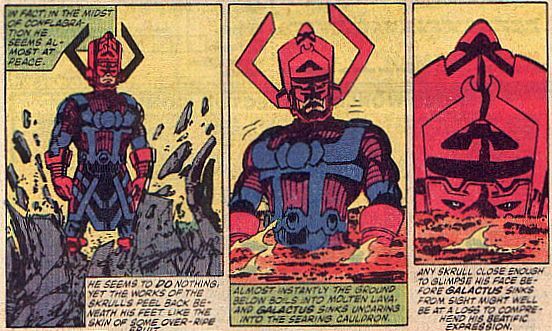 On the basis of being a Galactus book, however: *** 1/2. 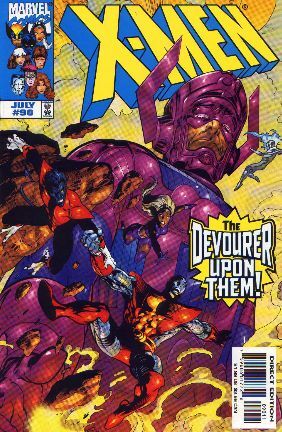 As for X-Men 90, I'd have to say four stars, simply because it did what Marvel (and X-Men) typically does so well: give the hero(es) that sense of humanity -- you really care whether or not Professor X can convince Galactus not to chomp on the Skrulls. 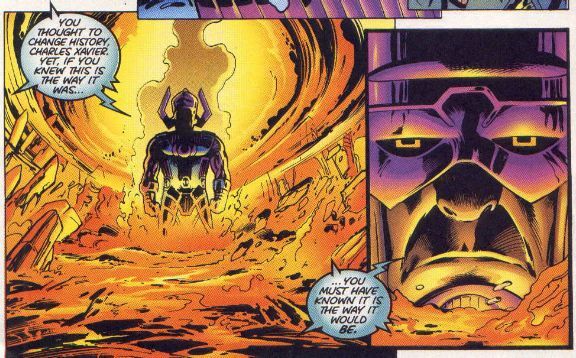 For More on GALACTUS, Visit "Bring on the Bad Guys, The Villains of Marvel Comics!"